An interface describing the data API. The structural data is accessible through this interface via a flat structure, instead of the usual hierarchical data encountered in PDB structures: structure to model to chain to group to atom. Going back to a hierarchical view of the structure can be achieved by using the getChainsPerModel(), getGroupsPerChain() and getGroupTypeIndices() methods so that the flat arrays can be reconstructed into a hierarchy. Please refer to the full MMTF specification available at http://mmtf.rcsb.org. Further reference can be found in the mmCIF dictionary. Returns an array of location ids of the atoms. Returns an array of atom serial ids (_atom_site.id in mmCIF dictionary). Returns an array containing the B-factors (temperature factors) of the atoms in Angstroms^2. Returns the name of the transformation for a bioassembly. Returns an array of internal chain identifiers (asym_ids in mmCIF dictionary), of length the number of chains (polymeric, non-polymeric and water) in the structure. Returns the list of chain indices for the given transformation for the given bioassembly. Returns an array of public chain identifiers (auth_ids in mmCIF dictionary), of length the number of chains (polymeric, non-polymeric and water) in the structure. Returns an array containing the number of chains (polymeric/non-polymeric/water) in each model. Returns the deposition date of the structure as a string in ISO time standard format. Returns the chain indices for the entity specified by the index. Returns the entity description (as defined in mmCIF dictionary) for the entity specified by the index. Returns the sequence for the entity specified by the index. Returns the entity type (polymer, non-polymer, water) for the entity specified by the index. Returns the experimental methods as an array of strings. Returns the atom charges for the group specified in getGroupTypeIndices(). Returns the atom names (e.g. Returns the zero-based bond indices (in pairs) for the group specified in getGroupTypeIndices(). Returns the bond orders for the group specified in getGroupTypeIndices(). Returns the chemical component type for the group specified in getGroupTypeIndices(). Returns the IUPAC element names (e.g. Returns an array containing residue numbers (auth_seq_id in mmCIF dictionary) for each residue (group). Returns the group name for the group specified in getGroupTypeIndices(). Returns an array containing the indices of groups (residues) in their corresponding sequences, obtainable through getEntitySequence(int). Returns the single letter amino acid code or nucleotide code for the group specified in getGroupTypeIndices(). Returns an array containing the number of groups (residues) in each chain. Returns an array containing indices to be used to obtain group level information, e.g. Returns an array containing the insertion codes (pdbx_PDB_ins_code in mmCIF dictionary) for each residue (group). Returns the zero-based bond indices (in pairs) for the structure. Returns a 4x4 transformation matrix for the given transformation for the given bioassembly. Returns a string describing the producer of the MMTF file. Returns the MMTF version number (from the specification). Returns the NCS operation matrix list. Returns the number of atoms in the structure. Returns the number of atoms in the group specified in getGroupTypeIndices(). Returns the number of bioassemblies in this structure. Returns the number of chains (for all models) in the structure. Returns the number of groups (residues) in the structure that have experimentally determined 3D coordinates. Returns the number of models in the structure. Returns the number of transformations in a given bioassembly. Returns an array containing the occupancy values of the atoms. Returns the release date of the structure as a string in ISO time standard format. Returns the resolution of the dataset. Returns the Rfree of the dataset. Returns the Rwork of the dataset. Returns the space group of the structure. Returns the identifier of the structure. Returns the title of the structure. Returns the 6 floats that describe the unit cell. Returns an array containing the X coordinates of the atoms in Angstroms. Returns an array containing the Y coordinates of the atoms in Angstroms. Returns an array containing the Z coordinates of the atoms in Angstroms. Returns an array of location ids of the atoms. '\0' specifies a lack of alt id. Returns an array containing the insertion codes (pdbx_PDB_ins_code in mmCIF dictionary) for each residue (group). '\0' specifies a lack of insertion code. Returns the group name for the group specified in getGroupTypeIndices(). to link groups to the 3 letter group name, e.g. HIS. groupInd - The index of the group specified in getGroupTypeIndices(). a 3 letter string specifiying the group name. Returns the atom names (e.g. CB) for the group specified in getGroupTypeIndices(). Atom names are unique for each unique atom in a group. A list of strings for the atom names. Returns the IUPAC element names (e.g. Ca is calcium) for the group specified in getGroupTypeIndices(). an array of strings for the element information. an array of integers (1,2 or 3) indicating the bond orders. Returns the zero-based bond indices (in pairs) for the group specified in getGroupTypeIndices(). (e.g. 0,1 means there is bond between atom 0 and 1). an array of integers specifying the bond indices (within the group). Indices are zero indexed. an array of integers indicating the atomic charge for each atom in the group. Returns an array containing indices to be used to obtain group level information, e.g. through getGroupAtomCharges(int). Returns an array containing the indices of groups (residues) in their corresponding sequences, obtainable through getEntitySequence(int). The indices are 0-based and specified per entity, -1 indicates the group is not present in the sequence. bioassemblyIndex - an integer specifying the bioassembly index (zero indexed). an integer specifying the number of transformations in a given bioassembly. a string specifying the name of a given bioassembly. transformationIndex - an integer specifying the index (zero indexed) for the desired transformation. a list of indices showing the chains involved in this transformation. Returns a 4x4 transformation matrix for the given transformation for the given bioassembly. It is row-packed as per the convention of vecmath. (The first four elements are in the first row of the overall matrix). transformationIndex - an integer specifying the index for the desired transformation (zero indexed). the transformation matrix for this transformation. Returns the zero-based bond indices (in pairs) for the structure. (e.g. 0,1 means there is bond between atom 0 and 1). an array of integers specifying the bond indices (within the structure). Indices are zero-based. Returns a string describing the producer of the MMTF file. e.g. 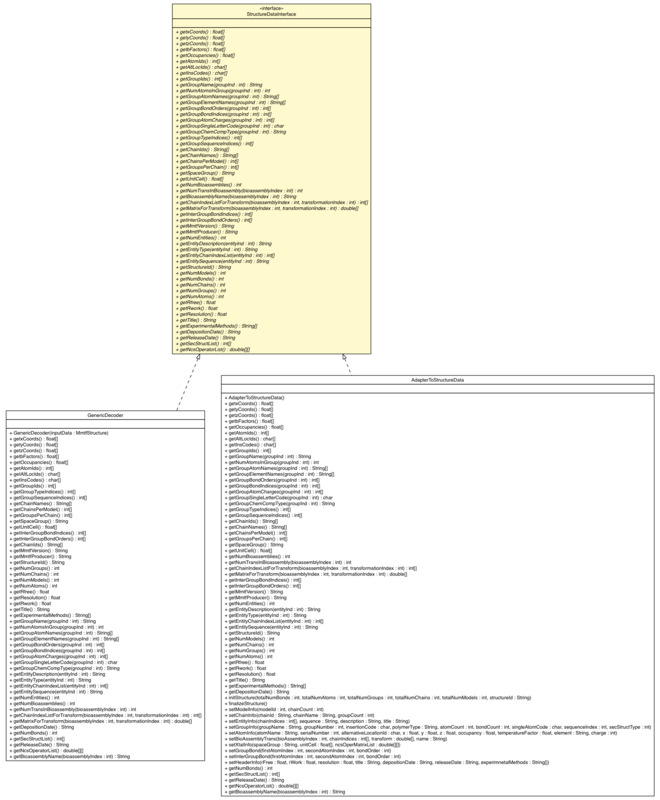 "RCSB-PDB Generator---version: 6b8635f8d319beea9cd7cc7f5dd2649578ac01a0"
entityInd - the index of the specified entity. the chain index list - referencing the entity to the chains. the one letter sequence for this entity. Empty string if no sequence is applicable. the title of the structure. the deposition date of the structure. the release date of the structure. Copyright © 2015–2016 RCSB PDB. All rights reserved.